Believe it or not, Disney is about more than just cartoons and creepy singing automatons. 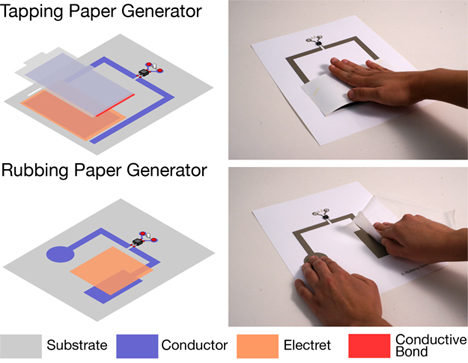 Their research division is constantly coming up with some pretty crazy technology, and they haven’t failed us with their newest unveiling: a “paper generator” that produces power from the simple acts of touching, sliding or rubbing its components. 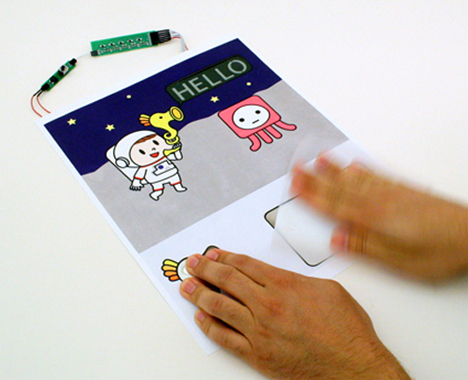 According to Disney Research in Pittsburgh, this small and inexpensive energy harvesters could be used in books and other printed media to light up LEDs, activate e-paper displays, play simple animations and sounds, or power little games. They weren’t kidding about the simplicity of the setup. Its components are Teflon, paper, conductive adhesives, silver-coated polyester, wires, and plain old tape. Rubbing the paper against the Teflon creates a small amount of voltage which can power lots of amazing little actions that were previously limited by the size of the required power source. This setup is flat enough to fit into a kids’ book and cool enough to entertain and amaze kids and adults.